Waterwise®, a company that produces and sells steam water distillers, commissioned this piece in response to recent articles saying steam distilled water does not have the proper pH for our bodies. It was a rewrite of a scientific document that their average end user had difficulty understanding. After this piece was mailed to customers, inquiries on the subject dropped, but sales did not. If you are reading this article, you are probably one of the growing group of people in this country who have begun to take their health and well-being into their own hands. That’s great! Good for you! But it’s not an easy task. There is so much information so easily accessible on the Internet these days. So much of it is confusing, or even downright contradictory, that it’s hard to know what to believe. To further complicate things, many “informational articles” are not based on any solid scientific evidence at all. They are usually based on sound logic, but there’s a problem with logic: It’s only as good as the facts. One little fact missing or inaccurate and the best logic in the world will not get you a workable answer. While most of these articles do have some truth in them, they are usually missing pertinent facts. Worse yet, many of them target our fears, making them seem much more urgent than they really are. Is the pH Too Low? One of the latest in this category is articles that tell us not to drink steam distilled water because it is too acidic. That is, its pH level is too low. Because the body is already acidic, the argument goes, we should balance that by drinking more alkaline water Not to despair, though The writers of these articles have the solution: Alkalizing drops or an alkalizing machine or some other fix-it. The true parts of this argument are that our bodies are a largely acidic environment and that a more alkaline diet is probably a good idea. It is true that high acid levels in the body can be a culprit in joint pain, fatigue, frequent colds and infections, osteoporosis, acid reflux and heartburn, and the list goes on and on. But is stopping the consumption of pure, clean, steam distilled water going to help? It is the measure of how many hydrogen ions are in a substance. Water—H2O—breaks down into hydrogen (H+) ions and hydroxyl (OH-) ions. Ideally, the two are perfectly balanced, or neutral, yielding a pH of 7.0 on the scale of 0–14. More hydrogen ions and the pH lowers, indicating the substance is more acidic. Fewer hydrogen ions, and the resulting higher pH reflects the increased alkalinity. Normal healthy blood is not a neutral 7.0, but has a pH of 7.35–7.45. Therefore, the logic goes, we should drink water that is a little bit alkaline rather than perfectly neutral. What is the Optimal pH? Low pH has been found to be a factor in just about every disease you can name, from cancer to arthritis to the common cold. So, it does seem reasonable to suggest we try to keep our bodies more alkaline. However, there is conflicting evidence regarding the body’s ideal pH level. Dr. Carey Reams, who holds PhD’s in biophysics and biochemistry among others, is credited with helping over 99% of the people he has treated, many of whom had cancer, simply by altering their diets. He has found evidence suggesting that the ideal pH level is not 7.0, but rather 6.4, slightly acidic. So, maybe we shouldn’t try to raise our body’s pH levels. Is Distilled Water Really Acidic? Testing water as soon as possible after distillation will usually give you a slightly acidic reading, about 6.5. As soon as distilled water is exposed to air, the pH drops because it absorbs the CO2 in the air. Movement, however minimal, will aerate it, lowering the pH even more. Does that mean that simply, say, swirling the distilled water makes it more corrosive? No. It means the pH level of distilled water fluctuates easily. This is not true of other less pure waters, and this is critical to the understanding of this whole issue. Distilled water has virtually no dissolved particles in it to buffer the affects of added substances that influence the pH level. Less pure waters do. If you were to take a dry toothpick and dip it in a container of baking soda—a highly alkaline substance—and put it into a liter of distilled water, the pH could rise up to 2 full points. Putting that same amount of baking soda into tap water would produce almost no measurable change. 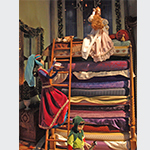 Think of the story of the princess and the pea: The greater the purity, the greater the sensitivity. Why Not Alkalizing Drops or Treatments? Because there is no evidence they actually do anything. Like the claims that distilled water will leach your body of minerals because it does not contain any, it seems reasonable, but is without any supporting data whatsoever. So, How do We Raise Our pH Levels? After all, one of the kernels of truth we started with was that low pH levels in the body can be injurious to our health. It would be great if the solution was something as simple as adding a few drops of something to our water, but it’s not. It is pretty easy, though. You just have to watch your diet. While different sources further complicate the issue by listing different foods as acidic or alkaline, one thing seems fairly certain: Processed sugars, animal proteins, and alcohol reduce the body’s pH. Beyond that, if you’re serious about this, contact us and we will send you some litmus paper, and you can see for yourself how different foods affect your body’s pH. So, Now You Know the story. So, I guess it’s a good thing you’ve decided to take your health into your own hands, isn’t it? This is something you absolutely can control. As with any lifestyle change, try to make it a gradual, gentle change. It’s not a good idea to shock your body by, say, suddenly cutting out all acidic foods in one grand sweep. Treat your body with respect and it will take good care of you.